AP Proposals for 1500 Language Pandits post as School Assistant (Languages) and 500 PET posts as School Assistant (Physical Education) in Success Schools up-gradation of LPs / PETs (2nd Phase) posts as per Lr.Rc.No:882/AP Upgradation of Language Puncifts and PETs upgradtion of 1450 Language Pandits posts Gr-11 as School Assistant (Languages) and 1200 PET posts as School Assistant (Physical Education) as per Lr.Rc.No:882/AP Proposals for up-gradation of LPs / PETs (2nd Phase) posts as per Lr.Rc.No:882. AP School Education Proposals for up-gradation of LPs / PETs (2nd Phase) posts in the Districts Note for favour of kind approval to submit the proposals to the Government Proposals submitted Regarding as per Lr.Rc.No:882/(D14)Estt.IV/2011 Dated:17/07/2018. G.O.Ms No.144, Finance (HR.II) Dept. dated 02.08.2016. Govt. Memo No.10093/Ser.11/A.1/2012. dated: 25.10.2016. CSE Proc.Rc.No.882/(:31-4)EsILIV/201 I, 01:20.01 .2017. Representations received from certain Teachers' Associations. Ir. Rc. No. Spl./2017. Dt:27.01.2017 of the District Educational Officer. Krishna. Machdipalnam. Rc. Nu. 415/C4/C6/2017, D1:30.01.2017 of the District Educational Officer, YSR Kod0PD. 1 wish to submit that, in the reference I Ith cited. the PS to Honble Minister for (HRD). Govt. of AP through mail has communicated the issues related to Education Deportment and 28th point of the agenda Is up-gradation of Language Pandits and PETs. Upgradotlon of LPs / PETs is also one of the demand of FAPTO. Further. I submit that Government have issued orders according sanction for upgradtion of 1450 Language Pandits posts Gr-11 as School Assistant (Languages) and 1200 PET posts as School Assistant (Physical Education) vide G.O.Ms.No.144 Finance (HR.II) ) Department dated 02.08.2016. Further, I submit that there n dire need of up-gradation of Language Pandits (Grade-II) Posts and PETs In High Schools as School Assistant ILanguageS)/SChool Assistant (Physical Education) due to the following reasons. The language pundits Grade- II are working in both UP Schools and High Schools and PETs In High Schools. As per Service Rules the qualifications required for the posts of School Assistants (Languages) and Language Pandits are same. The scale of pay of School Assistant is Rs.20940-789t0. 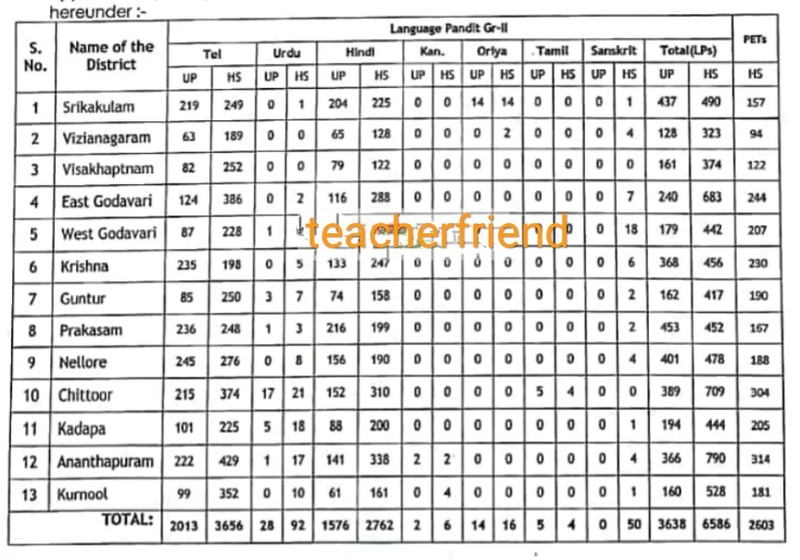 The Scale of Pay of Language Pandit Grade-r1 is 21230-63010. The Language Pandh requested to upgrade the Language Pandit posts to that of School Assistants (Languages) for parity with the other subject teachers working in the High Schools. Si As per RTE norms the staff pattern of all the High Schools shall have School Assistants. By virtue of working In High Schools the LPs /PETS will be automatically become SAs. There by the LPs / PETs will no more in existence. Since the qualifications In LPs Grade - it and School Assistant Language are one and the same, the LPs will have parity on par with the SAs (Languages). Thereby it contributes for quality improvement. The upgraded posts will be allocated to the School/High schools as per their request/roll. Further. I also submit that the Qualifications of the post Physical Education Teacher and School Assistant (Physical Education) are chlferent and there is need to continue Physical Education Teachers In the High Schools. I submit that proposals were submitted to the Government for creation of 1021 PET posts in the Slate. Further. I also submit that the scale of pay of LP / PETS is 21230 - 63010 SA (Telugu) & Hindi), SA (PD) scale & pay 28940 - 78910. the difference in basic pay Is 7710/-. If all the LPs and PET working In the State get upgraded at once. it would make an additional burden of Rs.9.89 Crores per month (Total teachers 12.827 X 7.710/- = 9.89 Crores). But most of the teachers working in existing sanctioned LP/PET posts have completed minimum service and thek basic pay is nearer to the School Assistants / SA (PD). Hence. even if these teachers were given promotions with 2 to 4 increments there would not be huge burden as Govt. exchequer. It three increments added i.e.. Rs.2460 X 12.827 = 3,15,54.420/-(Approximately 3.15 crores) per month. In view of the above. I request the Govt. to issue necessary orders in upgradation of the following language pandits/PHs in the State towards improvement of Education. 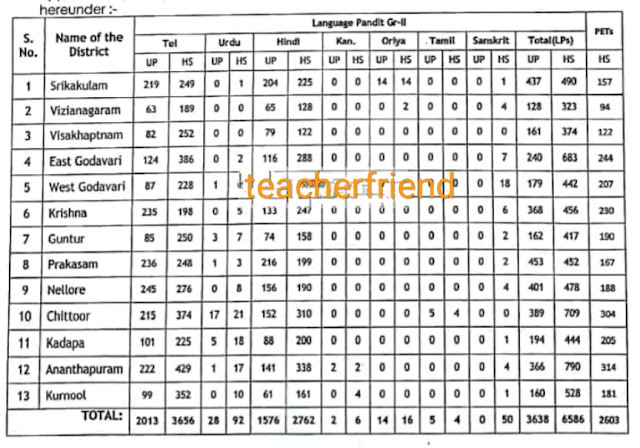 (I) 10224 Language Pandits posts as School Assistant (Languages) In U.P. & high Schools. (ii) 2603 PET posts as School Assistant (Physical Education) in High Schools. Get Downloading Lr.Rc.No:882 Click Here.